All images copyright © 2001-2005 by Wm. Robert Johnston, unless otherwise indicated. 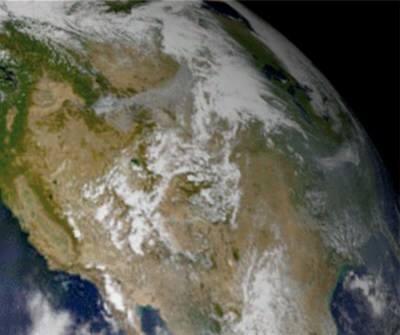 This is a view of the lower 48 states of the United States from 3,100 km above the Earth's surface. The Earth uses the surface and cloud maps from James Hastings-Trew. The cloud transparency is colored plain white, however, in contrast to the white-and-blue cloud map. 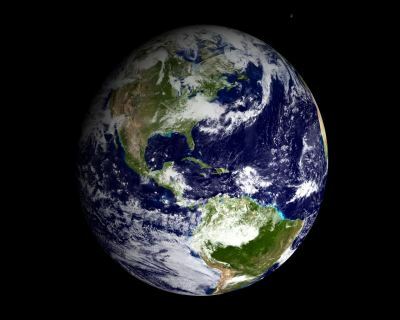 Here is a wide-angle view from only 630 km above the Earth. 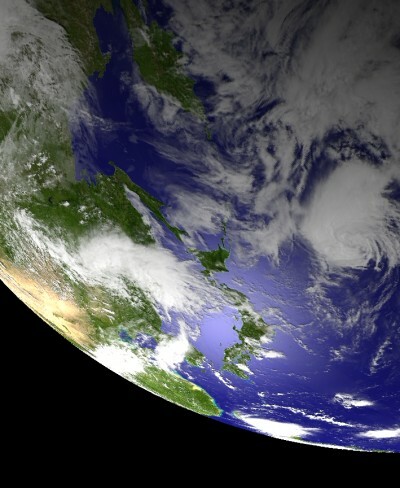 It shows a view to the west over Indonesia. Field of view is about 60°. This rendering is an experiment with clouds and sunset lighting. The Earth map is the one used above from James Hastings-Trew. The cloud map is derived from a photo of clouds over the North Pacific taken from a shuttle orbiter and found at NASA's Gateway to Astronaut Photography of the Earth. 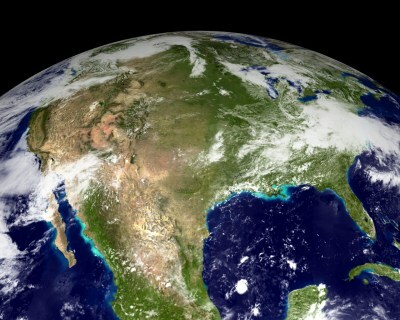 This view is from 3,100 km above the Earth, showing part of the United States. 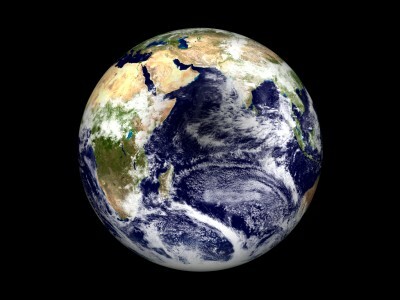 The Earth image is reprojected from an image from Visible Earth. The original image is by the SeaWiFS Project (credit: NASA/Goddard Space Flight Center and ORBIMAGE). Contrast the true appearance of clouds in this image with that in the preceding images. 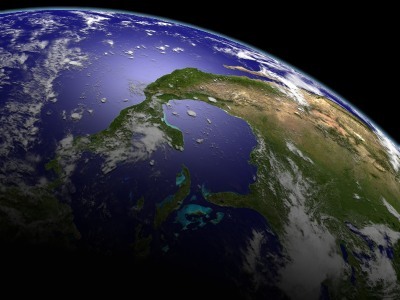 This nearly full Earth is seen from 12,000 km above the Earth's surface. The Earth map is from Visible Earth. Field of view is 60°. 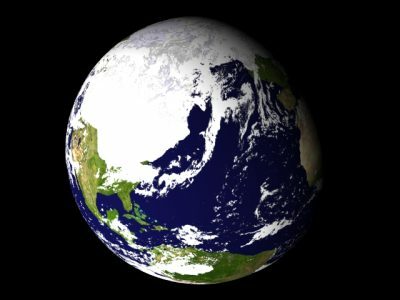 This depicts the Earth about 16,000 B.C., when glaciers in the last Ice Age reached their maximum extent. Large areas of North America and Europe were covered by ice sheets, and sea level stood about 120 meters lower than today--note the smaller Gulf of Mexico and the absence of the North Sea. In western North America Yellowstone was covered in glaciers and large portions of Utah were under water. 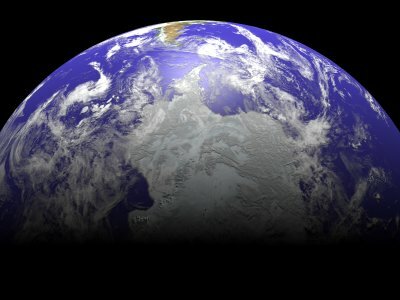 Starting with an Earth map from Visible Earth, I used various sources to modify the map and show some of the changes in ice/water/vegetation coverage. 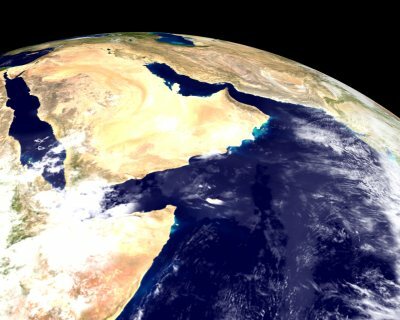 A view of the Middle East from 3,600 km above the Earth. This uses the Earth map from Visible Earth. From 16,800 km above the Indian Ocean, this view shows the Earth during a solar eclipse. The shadow of the Moon is visible on the Indian Ocean. Field of view is 50°. This experiment with shadows uses the Earth map from Visible Earth. This view from 39,500 km above the Earth shows Mexico, much of the United States, and Central America. Shallow water in the Bahamas is visible. This map uses modified versions of Earth maps, cloud maps, and ocean maps from the Visible Earth website. 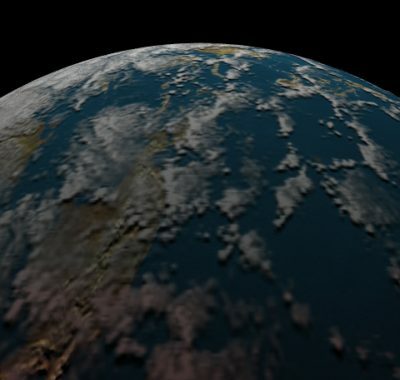 The experimental addition of the atmosphere above the Earth's limb was doen in Paint Shop Pro 7. This view from 7,800 km above the Earth shows Japan with Kamchatka at the top and mainland China to the lower left. This image uses the same maps as the preceding image. This view from over the South Pole shows clouds over Antarctica, with the tip of South America in the upper center. 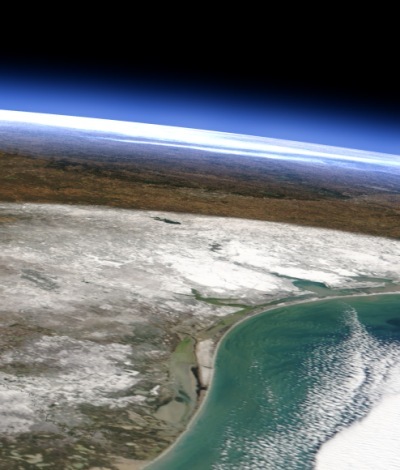 This is the view someone would have had viewing south Texas on Christmas Day, 2004, from 65 km altitude. At the lower left Brownsville, Texas, and Matamormos, Mexico, are still partly covered by their first snowfall since 1895. Just right of center heavier snow covers the Kingsville-Corpus Christi-Victoria area. At the horizon at the top, the white there is snow also, on the ground in west Texas. This uses MODIS images from the TERRA satellite. The atmosphere effect at the horizon was added using Paint Shop Pro. Copyright © 2001-2003, 2005 by Wm. Robert Johnston. All rights reserved.